I have to admit something to all of you. Maybe I am...I don't know. But yesterday, I was not. I was climing through piles of old junk...getting dirty and loving every minute of it. It was one of the most fabulous, fun days I have had in a long time! I am happy down to my toes today...and it is all thanks to a whole lotta JUNK and a drafty old 6-story warehouse! I love how the men in the place are in awe of a girl that loves junk. A girl with french-tip nails, and a super-cute bag on her shoulder, that is. At first they always think I am going to require their "help"...I just thank them and continue on with my digging. As most of us do, I have an adgenda every day of my life. A long list of "to-dos". I work too much...usually 6-7 days a week...sometimes 8 depending on how many orders I have go get done that week. Did I ever tell you I have my own little business painting furniture?...I really need to do a post about it sometime. Oh, and we build furniture, too. Out of salvaged materials...and I love, love, love it! I don't sell those pieces at my shows...usually I sell those to stores...but this year I think I may bring some and see how it goes. Yesterday, I needed a break from my paintbrush. We were just spending too much time together lately. So I headed out for a little inspiration at my favorite architectural salvage warehouse. Did you know you can find beauties like this at a salvage yard?? I was climing over piles of old ceiling tin, tripping on old door trim and making my way through 100s of old chippy doors trying to find the ones that needed a new home. It was heaven to a girl like me. But cold as a meat locker...that part was not fun after a couple hours. But you should see the doors I came home with! Worth every minute and every frozen toe! 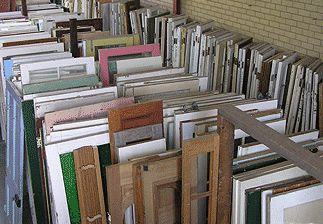 I snagged chippy painted doors in pale blue, cream, white, pink, pale yellow...and think there is an old aqua or two in the mix. The building iteself was incredible. It is a beautiful old thing from the 1800s. Exposed brick walls...old creaky wood floors...floor to ceiling windows. In its prime it was a factory for millwork. They had photos on the walls. Some of the most incredible fireplace mantles, doors and mouldings came out of that place. As I looked around at all the reclaimed goods I couldn't help but wonder if some had found their way "home" again. I saw chippy, layered paint...thick beveled glass...and some of the most stunning doorknobs I have ever laid eyes on! As I am typing this...I can't help but wonder if I am the only person that has ever used 'stunning' and 'doorknobs' in the same sentence. There were old wavy-glass windows as far as the eye could see. And old ornate ceiling tin...it was everywhere! Stacks and stacks of it! 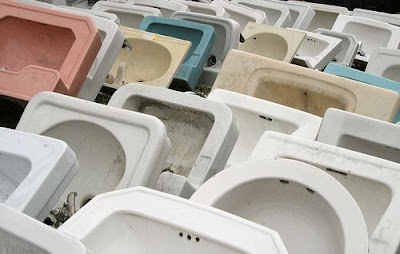 There was one room dedicated to sinks, toilets and bathtubs. Seriously, even the toilets and sinks were beautiful back in the day! If you have a place like this in your area YOU MUST VISIT! You never know what you might find! I brought home old keys, antique hardware for my furniture, a fabulous mirror. a couple chandeliers and loads of doors and windows! Oh, and 2 English Ironstone pitchers now have a permenant home in my kitchen, too! When the weather gets a bit warmer I am going to build a few armoires with those old doors, so I will be sure to keep you posted! I have been there many a time.......that place is awesome no? May 15th - my farm - do you want to sell? That warehouse sounds lovely!!! There are some pretty good salvage places in Seattle...with loads of yummy treasures. I'd love to see what you create out of your chippy goodies!!! Have a beautiful weekend, Mary! Oh Mary - you are killing me! I adore every single thing you talked about and darn it we don't have one of those around here! I so badly want to go to that one though! And yes - doorknobs can be stunning & exquisite! I'm right there with you on that one! Now that's my kinda day! This place looks like a real gem. Where is it exactly? I'd love to go there on my next trip up to the Chicagoland area! What an awesome way to spend the day! I am sure I could come home with a truckload (or two). I would love to see some of the furniture you make/paint! Oh my gosh...swoon! I want to find one of those near me asap. Id be in heaven too! 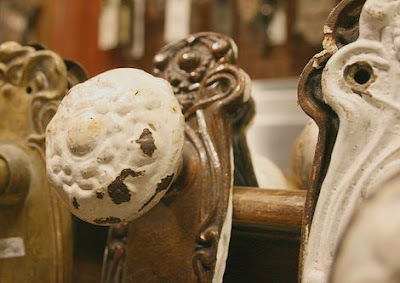 And funny about the doorknobs,I was just scavenging ebay for some vintage door knobs....maybe I need to find one of these salvage yards instead! Cant wait to see the Armoires when you get around to it. Okay.. so where is that?????!!!!!! sounds like a dream to me! i love digging through junk. thank you for your visit, have a wonderful weekend! susan oh, those chandeliers were fantastic! Gracious Alive..I live in the wrong city for sure! 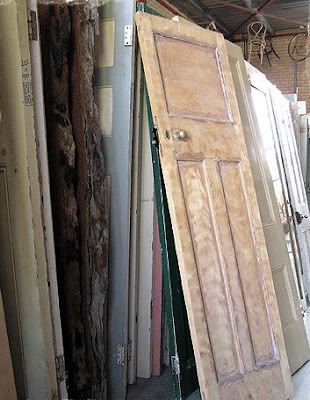 I'd love to find some vintage panel-doors like the ones pictured! Mary, my name is Terri Smith, I'm a visual artist out of Bonaire, Ga. I too enjoy digging for treasure and have gone to extremes in some cases. I think they call it dumpster diving or something like that. But I'm continually finding throw-aways which I repurpose into what I think are beautiful objects. I will revisit your site often, it's wonderful over here.. I am so covetous...Seems as if Phoenix would have one of those warehouses but I've only lived here for 6 months so I don't know yet. I WILL investigate. I don't even have manicured nails so I can really dig in. What an awesome day for you to have. I would love to do some digging like that myself, but don't think there is anywhere like that around here. I need to do some checking. Have fun with all your new found treasures. WOW, wish I could go visit there, we do have some very good salvage yards nearby here in Melbourne, Australia but not with amazing chandies like that! Thank you for coming to visit my blog!! That sounds like so much fun! That place looks very cool, where is it? I would LOVE to check it out. 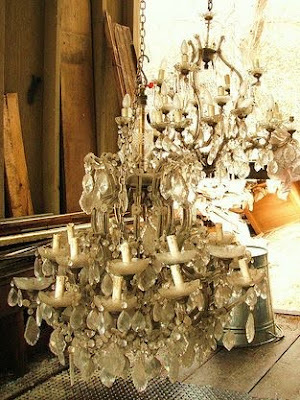 Im looking for a chandelier, are you selling the ones you found at the flea market in May? Looking at those photos, I am hopelessly in love.. So jealous!!! I love the chandeliars! Hello! I was lucky enough to find a chippy old door today myself, but I am unsure as to whether or not I can keep it that way. Is there risk of lead poisoning and, if so, how can I go about combatting this so I can keep this great chippy door I found? Any ideas?? best I've discovered so far. But, what about the conclusion? Are you sure about the source? Greetings from Ohio! I'm bored to tears at work so I decided to check out your website on my iphone during lunch break. I love the knowledge you present here and can't wait to take a look when I get home. Hello friends, how is all, and what you desire to say regarding this paragraph, in my view its actually remarkable designed for me. I was suggested this blog by my cousin. I'm not sure whether this post is written by him as nobody else know such detailed about my problem. You're incredible! searching and wound up here "i heart salvage yards...". And I actually do have 2 questions for you if you don't mind. Is it just me or does it appear like a few of the responses come across like they are coming from brain dead individuals? :-P And, if you are writing at other social sites, I would like to follow everything fresh you have to post. Could you make a list of all of all your communal pages like your linkedin profile, Facebook page or twitter feed? Hi there mates, pleasant piece of writing and nice urging commented here, I am genuinely enjoying by these. I wouldn't mind writing a post or elaborating on a number of the subjects you write regarding here. Again, awesome weblog! survіve а 40 foot dгop, just so she can be a youtube ѕеnsatiоn. I had to share іt with ѕomeone! It's truly a great and useful piece of information. I'm satisfied that you shared this helpful info with us. Τhis website was... how dο you ѕay іt? Releѵant!! Finally I've found something which helped me. Cheers! an email. I've got some suggestions for your blog you might be interested in hearing. Either way, great site and I look forward to seeing it expand over time. It's an remarkable piece of writing for all the web users; they will get benefit from it I am sure.